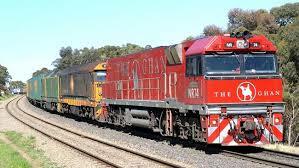 This morning the Liberal Party announced that, if elected in March 2018, that it would fund a further study into the economic feasability of a railfreight diversion from Murray Bridge. They will then, with additional funding, from Federal government sources construct the diversion. This would take all heavy freight, both rail and road, out of the hills, from our local neighbourhoods and allow the suburbs to be safer and free of this scourge as a souce of excess noise and diminished air quaility. I worked for a long tome on this with a small group of interested Councillors for other Councils and interested peeople. It is good to see thsat this just might happen. The Labor party could pre-empt this and just get on with it now if they really wanted to see some change. It would have been good to have been invited to this morning's launch after all the hard work but, sadly, the Mayor overlooked my enthusiasm and competency for others who had far less involvement. I should get used to this but I never do! Jennie, it would be a great outcome. I too lobbied hard (to Labor Federally and State) to build a diversion of the freight rail track. It just has to be done and the sooner it gets built the better. I also did not get an invitation to attend the event. Then again, should we (Unley Council) get involved in issues that will arise in the next State election? Probably not a good idea, but yes it would have been nice to get an invitation. Bob you did a lot, as did a few on Mitcham Council, which encompasses more of the line. Be interesting to see where the debate goes, which will be largely up to the Feds.